The all-new Rolls-Royce Phantom arrives next year promising ride comfort and interior luxury of an unprecedented quality, as well as a greatly improved driving experience. Unveiled in London, the eighth-generation Phantom is the second to be built under BMW ownership and has been completely redesigned and reengineered from the ground up. It has been in development for six years and is the first in a series of all-new Rolls-Royces built on a bespoke aluminium spaceframe architecture. In 2019 the Phantom will be followed by the luxury car maker’s first SUV, codenamed Project Cullinan, while replacements for the rest of the range will be built on the same underpinnings as part of the ever greater autonomy Rolls is receiving from BMW. It is the Phantom that comes first for the new era of Rolls, with company boss Torsten Müller-Ötvös calling the fourdoor saloon “the pinnacle” of Rolls-Royce, the ultimate expression of the Rolls-Royce brand and the very top of the range, despite the growing popularity of SUVs. Rolls engineering chief Philip Koehn said the new architecture, called Architecture of Luxury, and the technology within it helps to create an “unprecedented blend” of ride comfort and stability. Power comes from a twin-turbocharged 6.75-litre V12 engine, while the car’s design is one of “effortless elegance”, according to styling boss Giles Taylor. The all-new aluminium spaceframe used by the new Phantom results in a significant 30% increase in rigidity over that of the previous car. 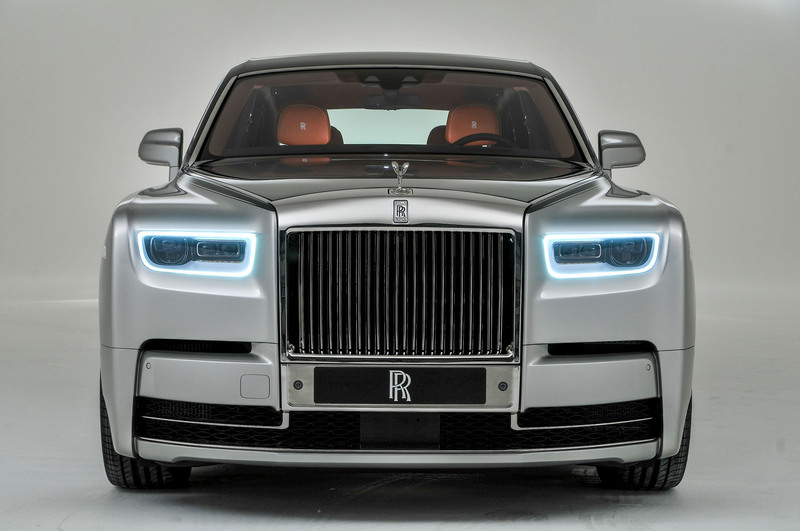 Rolls-Royce says the body is the stiffest in production, and it has required a huge investment in new technology for riveting and spot welding in order for it to build it. 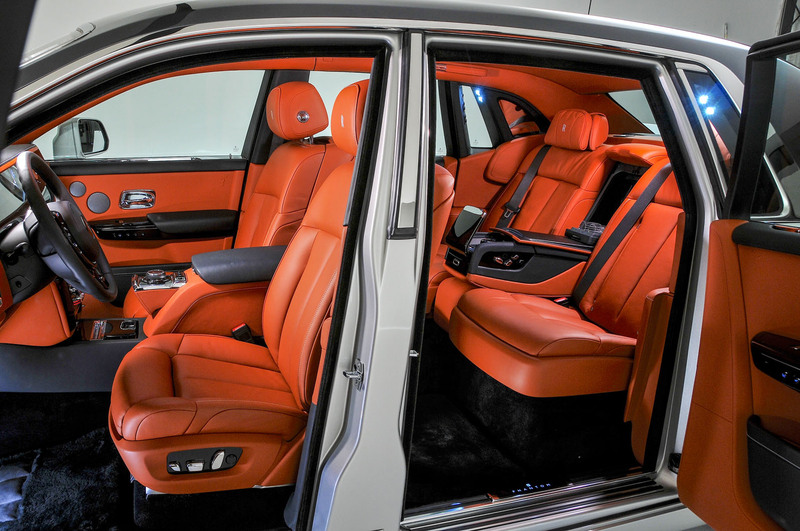 The architecture is one that is bespoke to Rolls and has no BMW content. The architecture is also much lighter than the outgoing car's, although the Phantom’s kerb weight increases from 2550kg to 2625kg due to the vast amount of new technology added to the four-door. There are new front and rear axle designs and air suspension with greatly improved travel at each corner. Double wishbones are used up front, with a multilink axle at the rear. Koehn said the ‘magic carpet’ ride “has been taken to the next level” thanks to these new designs and the stiffer body-in-white. However, Koehn promised that the enhanced ride quality has not been achieved to the detriment of handling, which is a key area Rolls wanted to improve on the new Phantom. To that end, a new 48V electrical architecture has been fitted, alongside chassis technology including active stabiliser bars to stop roll and four-wheel steering both to improve stability and agility and reduce the turning circle. 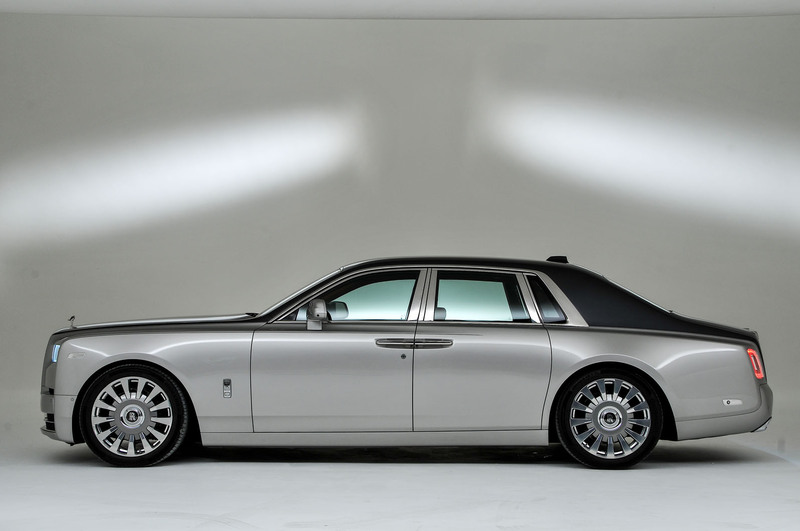 “This technology adds both stability and ride comfort for an unprecedented blend,” Koehn said, adding that the Phantom was now “rewarding behind the wheel as well as in the rear”. A new softer tyre compound from Continental, complete with its own sound deadening, has been made for the Phantom’s 21in front and 22in rear wheels to complete its dynamic armoury. Under the bonnet is a new version of Rolls-Royces’ 6.75-litre V12, which has the addition of twin turbochargers for the new car. The pistons, cooling system, crankshaft and engine management software are also new in an engine that Koehn describes as producing “pure thrust”. The V12 produces 563bhp at 5000rpm but its torque figure of 664lb ft is more significant, with full torque available from just 1800rpm. Koehn said pushing low-end torque “to the max” was a key part of the brief for the new engine. The engine could produce yet more torque, but Koehn said this “wouldn’t be appropriate”. The engine drives the Phantom’s rear wheels through an eight-speed automatic gearbox. Müller-Ötvös said a V12 was a key part of the Phantom’s appeal and that it “could not be a V8”. The Phantom can reach 62mph from rest in 5.3sec and hit a top speed limited to 155mph. It could go faster, said Koehn, but again this “wouldn’t be appropriate”. Stability is much improved above 100mph in the new Phantom compared to the old car, added Koehn. The Phantom is 8mm higher than before, at 1646mm, 29mm wider, at 2018mm, and 77mm shorter, at 5762mm in length, with a wheelbase that is 19mm shorter than before, at 3552mm, although a version with a 200mm-longer wheelbase will also be offered. Interior space has remained on a par with that of the current car, save for headroom, which has been increased. Taylor’s design team started work on the project six years ago, decamping six of his design team from Rolls-Royce’s Goodwood headquarters to London. “I gave them creative solitude for three months, locked the doors and told them to be inspired by London,” said Taylor. Taylor described the Phantom as a car, and Rolls as a brand, that is “about style rather than design”. His styling changes include a grille that now sits in the bodywork and leans back, rather than being a separate piece, mounted between laser headlights with 600 metres of vision. Taylor has strived for a “yacht-like profile” for the new Phantom, which leans back towards the rear and has lines that run from the bonnet rearwards to give a “more distinctive impression and more majesty”. The tapered, lowered rear of car, which has LED lights, is described as having a “gentlemanly” look. The stainless steel brightwork is all hand-polished, with the longest piece on the car being some three metres in length. There is also no shutline between the roof and pillars; instead, the area has been hand-welded and then handpolished and sanded by six people for a seamless join. The opulent interior offers “a sense of calm and isolation”, according to Taylor. 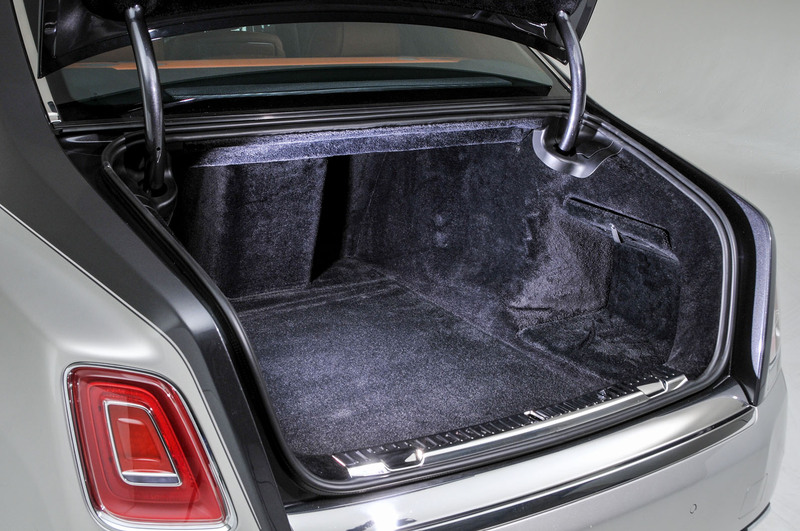 Rolls-Royce has increased the amount of technology offered in the car but has ensured it can all be hidden. “Our customers like technology but they also love analogue,” said Taylor. “The screens can all disappear.” Rolls has fitted a head-up display as standard in order to reduce the amount of information needed to be displayed on the instrument binnacle and present a cleaner and less cluttered look. Of most intrigue inside is a new glass fascia for the dashboard, marking the first time glass has been used for this part of a car. In time, Rolls is to allow customers to display specially commissioned pieces of artwork behind the glass on the passenger side of the car. The rear-hinged rear-doors remain and are powered, as are the front doors. There is also a big increase in sound-deadening material used for the cabin (130kg in total) to isolate it from the outside world, with the double glazing of all windows on the car being 6mm thick. Rolls says the Phantom is 60dB quieter than the previous car at 62mph. The eighth-generation Phantom will be offered as a saloon only and is expected to far exceed the price of the current Phantom, at a mooted £400,000. 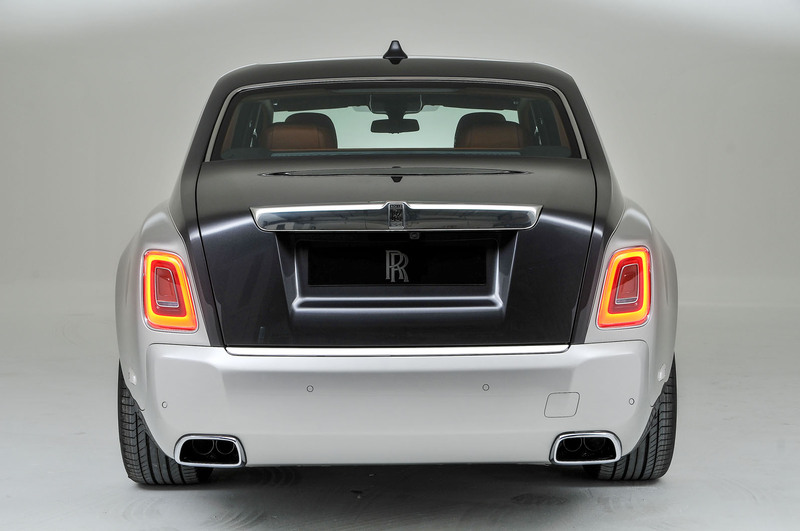 With no coupé or convertible models planned, those roles will be taken by the Wraith and Dawn. Peter Schwarzenbauer, Rolls-Royce chairman and BMW board member added "We're [BMW] quite happy to have this wonderful brand and develop it in future. This is not just launching a car, but setting a new standard for luxury overall". Agreed, its a joke and has no place in the history of the marque's quiet elegance.. Think you've got the wrong marque. RRs have long been a statement of wealth. That grille is hardly demure is it? This new Phantom looks very similar to the current one in pictures, but I imagine in the metal will look significantly more modern. Gawdy on the outside. And what's with the weird wood layering effect? Could that interior be any brighter? Hmm...disappointing and no advance visually, IMHO. The brightwork around the side windows looks rather clumsy and heavy-handed, particularly around the fixed rear three-quarter window. This is most obvious in the fifth and third from last photos above. Indeed, what on earth have RR done with the chrome work around the rear 3/4 windows, there are so many breaks !!! Hmm. Looks amazingly like a previous Phantom, sent to Kahn. And then fitted with lowrider suspension. 60dB quieter at 62mph? I wonder if the author appreciates how impressive that would be? I presume they mean 6 db and even that is impressive. Always best for journalists not to use scales they don't understand (for those who don't know it's a logarithmic scale, not a linear one) where 3db halves the volume.